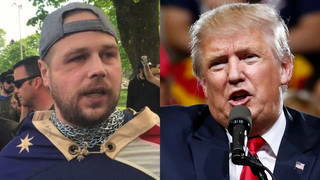 White House Defensive as Trump Shares British Hate Group Videos, Drawing International Condemnation | Democracy Now! President Donald Trump drew international outrage Wednesday after he retweeted three violent videos shared by a leader of the fringe, far-right-wing group Britain First. The videos purport to show violence carried out by Muslims. The videos were posted early Tuesday by Britain First deputy leader Jayda Fransen, who was arrested just days ago on hate speech charges over an appearance in Belfast last August. She was previously found guilty of religiously aggravated harassment after she verbally accosted a Muslim shopkeeper during a so-called Christian patrol last year in the English town of Luton. We get response from Mehdi Hasan, award-winning British journalist and broadcaster at Al Jazeera English and columnist for The Intercept. StoryMay 30, 2017Did Trump Campaign Rhetoric Empower the White Extremist Who Killed Two Bystanders on Portland Train? NERMEEN SHAIKH: President Donald Trump drew international outrage Wednesday after he retweeted three violent videos shared by the leader of a fringe, far-right-wing group, Britain First. The videos purport to show violence carried out by Muslims. The videos were posted early Tuesday by Britain First deputy leader Jayda Fransen. She was arrested just days ago on hate speech charges over an appearance in Belfast last August. She was previously found guilty of religiously aggravated harassment after she verbally accosted a Muslim shopkeeper during a so-called Christian patrol last year in the English town of Luton. Trump’s retweets drew condemnation across the political spectrum in Britain. Labour deputy parliamentarian David Lammy tweeted, quote, “The President of the United States is promoting a fascist, racist, extremist hate group whose leaders have been arrested and convicted. He is no ally or friend of ours,” end quote. In a rare rebuke, Conservative Prime Minister Theresa May said, quote, “It is wrong for the President to have done this.” But May did not rescind her government’s invitation to host Trump for a state visit. In the U.S., Muslim groups were swift to condemn Trump’s retweets. This is Ibrahim Hooper, head of the Council on American-Islamic Relations. IBRAHIM HOOPER: The conversation is designed to start as a conversation of hatred, bigotry and white supremacy, and it’s the same conversation that Donald Trump and his people around him have been pushing for years now. White House Press Secretary Sarah Huckabee Sanders was grilled by reporters over the videos. PRESS SECRETARY SARAH HUCKABEE SANDERS: Look, again, whether it’s a real video, the threat is real, and that is what the president is talking about. That’s what the president is focused on, is dealing with those real threats. And those are real, no matter how you look at it. AMY GOODMAN: Trump’s retweets drew praise from his far-right supporters, including the former Ku Klux Klan leader David Duke, who tweeted, quote, “This is why WE LOVE TRUMP and WHY the FAKE NEWS MEDIA HATES TRUMP. He brings to light what the lying, Fake News Media Won’t. The truth is the media covers up horrific numbers of racist hate crimes against White people!” David Duke tweeted. Well, for more, we go to Washington, D.C., where we’re joined by Mehdi Hasan, the award-winning British journalist and broadcaster at Al Jazeera English. He’s host of the Al Jazeera interview program UpFront and a columnist for The Intercept. He’s also a contributing editor at the New Statesman magazine in the U.K.
Mehdi, thanks so much for joining us. Can you start off by responding to President Trump retweeting these videos? And explain exactly what this group, Britain first, is. MEHDI HASAN: Britain First, as the mayor of London, Sadiq Khan, pointed out yesterday, is a vile extremist group. It’s probably Britain’s most well-known and most loathed far-right extremist group. It was founded by former neo-Nazis. Its chairman is a former neo-Nazi. Its current deputy leader, whose tweets Trump retweeted yesterday, has already been convicted for religiously aggravated harassment of a Muslim family, is currently on charges of threatening words and behavior. They operate so-called Christian patrols. They mount, quote-unquote, “invasions” of British mosques. This is a vile far-right, fascistic group. And the president of the United States decided to tweet them not once, not twice, but three times, retweet their fake videos. A president who is obsessed, Amy, with fake news, with calling CNN and ABC and NBC fake news, decided to tweet a fascist group’s fake videos. And I think we really have to take a moment to really absorb that. I don’t think we quite have absorbed how bad it is. You talked about international condemnation. Well, international condemnation is all well and good. Where’s the domestic condemnation? Not a single member of the White House has resigned over this. Not a single member of the Republican leadership in the House or Senate has come out and condemned this in strong terms. It’s almost like we’ve normalized the far-right behavior of the president of the United States. We’ve normalized anti-Muslim bigotry in this country, sadly. NERMEEN SHAIKH: And what about in Britain, Mehdi Hasan? To go back to the group itself, I mean, Britain First has very few followers in Britain, I understand, and is even rejected by the right-wing populist party, the U.K. Independence Party. MEHDI HASAN: Yes, even the United Kingdom Independence Party tries to distance itself from Britain First. It’s a group—Britain First is a group that gets very few votes in any elections. I think they got about 50 votes in a recent constituency election. None of their people come anywhere close to power, thank God, and none of them get a platform from mainstream conservative parties in the U.K.
MEHDI HASAN: But the state visit is still on. AMY GOODMAN: Let’s go to Brendan Cox. We have a clip of him, yes, the widower of the former Labour MP Jo Cox, as you said, who was stabbed and shot to death last year by Thomas Mair, when, apparently, during the attack, Mair shouted “Britain First!” talking about this group. Mair also, of course, had ties to the neo-Nazi National Alliance. This is Cox speaking on Wednesday. BRENDAN COX: I have to say, I thought it was a horrendous thing to do. Britain First is a well-known hate group. It drives hatred against Muslims. And Donald Trump is the president of our nearest ally. And the fact that he didn’t check first or didn’t even think about the content of those tweets before doing it, I think, suggests his judgment is hugely lacking. Cox also wrote an op-ed in The Guardian headlined “By retweeting Britain First, Trump offends a decency he cannot understand.” In the piece, Cox said Trump’s state visit should not happen. And that’s exactly what Sadiq Khan, the London mayor, has said. Brendan Cox, the widower of Jo Cox, then fired back at Trump, tweeting, “You have a mass shooting every single day in your country, your murder rate is many times that of the UK, your healthcare system is a disgrace, you can’t pass anything through a congress that you control. I would focus on that,” Brendan Cox tweeted. Now, interestingly, Trump initially addressed his tweet to a Twitter handle that was not Theresa May’s, but later retweeted to the British leader’s correct account. May was the first foreign leader to visit him after his inauguration, and has invited him for a state visit, which is now—many people in Britain, many political leaders, are saying she should revoke that invitation. Mehdi Hasan? MEHDI HASAN: Yes, and as you point out, you know, he tweets at the wrong Theresa May. This is not—people say Trump is impulsive on Twitter, he’s erratic, you know, he’s unstable. But, you know, here’s a guy who tweets at the wrong Theresa May. You might think, “OK, well, this is a moment now to undo that retweet.” No, no. He then retweets—he deletes that tweet and then retweets again with the correct Theresa May, to make sure that he attacks his close ally publicly, after a pointless spat that he started by deliberately retweeting fascistic videos. By the way, those videos are still up on his Twitter timeline, the last time I checked a few moments ago. He hasn’t un-retweeted those, despite this global furor and despite being told this is a fascist, far-right group. As for the state visit, the mayor of London, as you pointed out, Amy, has been saying, consistently, it’s time to rescind this invitation. The British government won’t do it. Theresa May, despite, as you pointed out, doing this rare rebuke, won’t do it. She has called this all wrong. I mean, for Theresa May, this is deeply embarrassing. As you say, she was the first leader to fly out and meet Donald Trump, where she held his hand at the White House. A new book is out in the U.K. which reveals that May and her advisers, after the election of Trump, believed that he would moderate, he would pivot, that, you know, he would become a much more normal president, as many people in the U.S. wrongly assumed. And he hasn’t. And he’s still doing these crazy things, endorsing conspiracy theories and far-right videos online. Every day of this week, Amy—I mean, literally since Monday—there’s been one mad statement or tweet after another. So for the British prime minister, it’s pretty embarrassing. For Trump, will he even go to the United Kingdom? I’m not so sure. Apparently, according to some reports, his people have been telling the British government he’s only going to come on a state visit if they can guarantee no protests. And, of course, the United Kingdom, last time I checked, is not the kingdom of Saudi Arabia. They can’t guarantee there won’t be free protests by free people on the streets against a white nationalist president who’s visiting from abroad. AMY GOODMAN: I want to ask you about Sarah Huckabee Sanders’ comment. We’ve played it several times now. AMY GOODMAN: But it is profound what she says. Let’s listen to it again, when she’s grilled by reporters over this video. AMY GOODMAN: So, there she says she doesn’t care whether the videos are real or not, Mehdi Hasan. It’s a real problem when journalists indulge this. You know, this week, Amy, is the White House Christmas party. Only CNN has said that they will not be going or sending any reporters. They will be boycotting it. Other networks haven’t taken that step. And we have this problem, Amy, that a lot of mainstream news organizations in this country simply don’t know, aren’t able to cope with a president who lies daily, who endorses conspiracy theories daily, who cavorts with far-right nationalists daily and has a press secretary who’s willing to lie on his behalf, cover up on his behalf, distort on his behalf, deny the truth on his behalf. How does the media cover a president and a press secretary like that? I would argue the first step is to say, “This is not normal, and we will not cover it in a normal way.” Until we do that, we will carry on lurching from daily crisis and controversy to the next.